Background: The subjective sensation of dry mouth, xerostomia, is a well-recognized problem in adults, however, relatively little attention has been paid to this issue in children. Xerostomia commonly occurs as an adverse effect of drugs in asthma and leukemia, which alter the composition and flow of saliva and systemic diseases, including diabetes. It decreases the oral pH and significantly increases the development of plaque and dental caries. Aim: This study aims to evaluate and compare the dental caries status and salivary properties of children aged 5–14 years undergoing treatment for acute lymphoblastic leukemia, type 1 diabetes mellitus, and asthma – in vivo. Materials and Methods: The study was divided into two parts: Part I: Oral examination was performed and dental caries status Decayed, Missing, Filled Teeth/ decayed, extraction, filled teeth (DMFT/deft) was noted and Part II: Salivary analysis was performed by GC Saliva-Check BUFFER kit to check for hydration, viscosity, pH of saliva, salivary flow, and buffering capacity. Statistical Analysis: All statistical analysis was performed using the SPSS 21 statistical software version. Inferential statistics were performed using Chi-square test and ANOVA. Post hoc pairwise comparison was done using Post hoc Tukey's test. 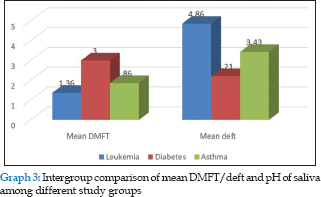 Results: The prevalence of mean DMFT/deft with regard to salivary properties was highest in leukemic patients followed in descending order by diabetic and asthmatic patients. Conclusions: Leukemic patients had significantly higher caries and decreased salivary properties while asthmatic patients showed the least caries prevalence and best salivary properties. Infants and young children always seem to have an excess of watery saliva, and there is unfounded belief that children cannot or do not suffer from salivary hypofunction (xerostomia). Xerostomia commonly occurs as an adverse effect of drugs in asthma and leukemia, altering the composition and flow of saliva, and systemic diseases (diabetes). As very scanty literature till date is available comparing the dental caries status and salivary properties of children undergoing treatment for systemic diseases, the present study was undertaken to evaluate and compare the same in children aged 5–14 years suffering from asthma, type 1 diabetes mellitus (IDDM), and acute lymphoblastic leukemia (ALL). The present study was conducted in the Department of Pedodontics and Preventive Dentistry, Sardar Patel Post Graduate Institute of Dental Sciences, Lucknow, in collaboration with Department of Haematology, Department of Endocrinology, and Department of Pediatrics, Sanjay Gandhi Post Graduate Institute of Medical Sciences, Lucknow, after approval from the Institutional Ethical Committee. Previously, a pilot study was carried out in the same departments to overview the proper study design and to take care of the possible constraints during the main study. Group C: Thirty patients aged 9–11 years undergoing treatment for asthma were included in this study. Patients were controlled asthmatics under β2-agonists inhalers at least of 6 months duration. Part I: Clinical assessment: Both parents and children were given the patient information sheet and were informed of the aim and nature of the study. A brief history was recorded and oral examination was performed and dental caries status [DMFT/deft index] was noted. Part II: Salivary analysis: To avoid bias of the salivary analysis, all patients were instructed not to drink, eat, brush their teeth, or eat chewing gums for at least 1 h before examination. It was performed using a standardized kit “GC Saliva-Check BUFFER kit” (GC Corporation, Tokyo, Japan) to check for hydration, viscosity, flow rate, pH, and buffering capacity. Normal – if it is more than 5.0 ml. Buffering capacity of stimulated saliva was determined by GC Saliva-Check BUFFER kit. 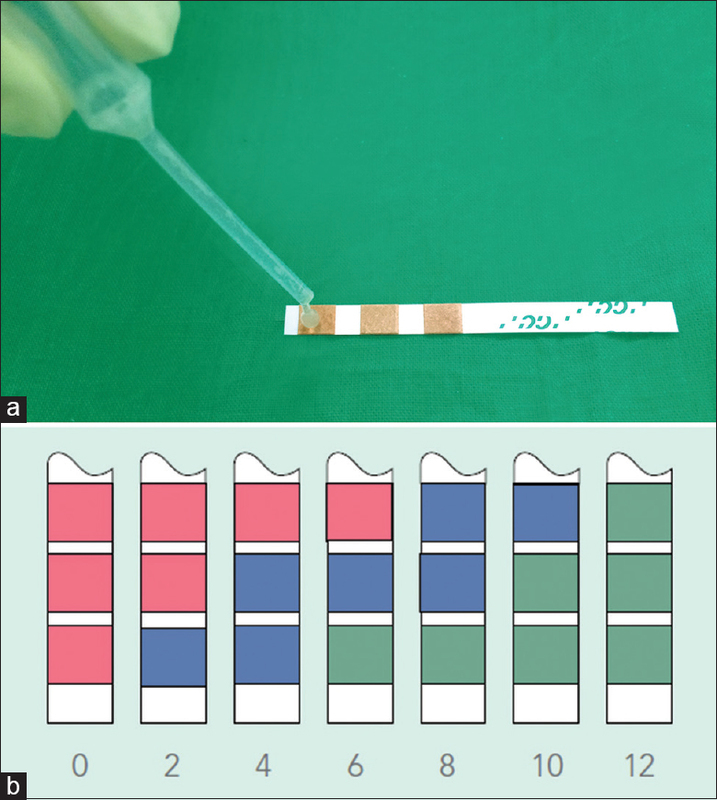 For this, we dispensed one drop of stimulated saliva in each of the three test bands using a pipette [Figure 3]a. The color of the field change was observed and results were assessed after the expiration of the manufacturer's reaction time (2 min) in color scale [Figure 3]b. After assessing the dental caries status and evaluating all the salivary parameters, the scores obtained were sent for statistical analysis. All statistical analysis was performed using the SPSS 21 statistical software version. Graphs were prepared on Microsoft Excel. The nature (continuous) and distribution (normal) of data, inferential statistics were performed using parametric tests of significance using Chi-square test and ANOVA post hoc pairwise comparison was done using Post hoc Tukey's test. The level of statistical significance was set at 0.05. [Graph 1] shows comparison of DMFT/deft with the hydration level using one-way ANOVA test and Tukey's test. 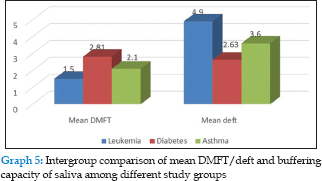 Mean DMFT/deft of Group A (leukemia) was significantly higher (P < 0.0001) than Group B (diabetes) and Group C (asthma), respectively. [Graph 2] shows the comparison of mean deft/DMFT with viscosity of saliva using one-way ANOVA test and Tukey's test. 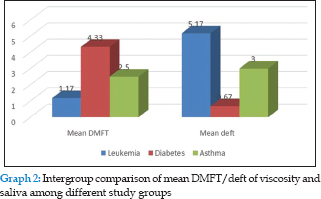 Mean DMFT/deft of Group A (leukemia) was significantly higher (P = 0.011) than Group B (diabetes) and Group C (asthma), respectively. [Graph 3] shows the comparison of mean deft/DMFT with salivary pH of saliva using one-way ANOVA test and Tukey's test. 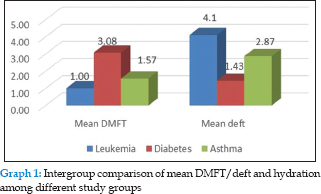 Mean DMFT/deft of Group A (leukemia) was significantly higher than (P < 0.0001) Group C (asthma) and Group B (diabetes), respectively. [Graph 4] shows the comparison of mean DMFT/deft with salivary flow using one-way ANOVA test and Tukey's. 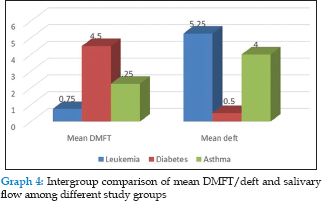 Mean DMFT/deft of Group A (leukemia) was significantly higher (P = 0.01) than Group B (diabetes) and Group C (asthma), respectively. [Graph 5] shows the comparison of mean deft/DMFT with buffering capacity of saliva using one-way ANOVA test and Tukey's test. Mean DMFT/deft of Group A (leukemia) was significantly higher (P < 0.0001) than Group C (asthma) and Group B (diabetes), respectively. Saliva plays a critical role in oral homeostasis, as it modulates the ecosystem within the oral cavity. Because infants drool and young children always seem to have an excess of watery saliva, there is unfounded belief in the dental profession that children cannot or do not suffer from salivary hypofunction (xerostomia). Regrettably, this is not so. The longevity of population, novel therapeutic techniques, and increased drug usage may affect oral structures, including salivary glands, most commonly causing xerostomia which could favor the development of local diseases. Xerostomia commonly occurs as an adverse effect of drugs in asthma and leukemia, which alter the composition and flow of saliva, and systemic diseases, including diabetes. It decreases the oral pH and significantly increases the development of plaque and dental caries. The types of cancer seen in children worldwide are very different from those found in adults, leukemia, lymphoma, and brain tumors being more common in children. Leukemia is the most common childhood cancer in India with relative proportion varying between 25% and 40%. Among various leukemias, ALL accounts for 60%–85% of all cases in children in India and is characterized by an excessive proliferation of immature white blood cells and their precursors which can be rapidly fatal. Advances in treatment regimen including multiagent chemotherapy, radiation, or bone marrow transplantation which has greatly increased the chances of survival. Variety of complications involving the oral cavity may be with cancer, either as a result of the disease itself or of treatment with chemotherapeutic agents. Chemotherapy may also adversely affect the salivary glands, resulting in an alteration of the quality and quantity of saliva. Mathur et al. (2012) also found that the chemotherapeutic agents modify the oral health, causing a significant increase in plaque and gingival indices. The effects of chemotherapy on human salivary glands and the composition of human saliva are difficult to assess and available information is relatively sparse and often contradictory. Type 1 diabetes accounts for 10% of cases and is one of the most common chronic diseases of childhood. It is caused by the autoimmune destruction of the beta cells of the Islets of Langerhans More Details of the pancreas, which leads to a total lack of insulin (WHO 2011). Cases of IDDM also increased significantly globally (Velegnova et al. 2014). According to the data of WHO, while the incidence of IDDM was low in Asia and south America whereas high in Europe and India. It is a metabolic disease with numerous systemic manifestations which are also noticeable in the oral cavity (Goyal et al. 2012). The oral complications of IDDM are numerous and devastating which includes xerostomia, an increased susceptibility to bacterial, viral, and fungal infections, increased risk for dental caries, poor wound healing, gingivitis and periodontal diseases. Asthma is a chronic inflammatory disorder of the airways, characterized by episodic and reversible symptoms of airflow obstruction. It has become one of the most common chronic medical ailments in children and its frequency has steadily increased in the last two decades because of change in environmental conditions (Stensson et al. 2011). The prevalence of asthma has increased, while the prevalence of caries, on the other hand, has declined in most industrialized countries. The management of asthma is complex and requires proper attention on the individualized factors such as type of medication used, frequency, and time of day which may play a very important role in dental caries risk. The goal of asthma treatment is to achieve and maintain clinical control of the disease. The AAPD Caries Risk Assessment Tool (CAT) stipulates that children with chronic conditions and who are taking medications may be at higher risk for dental diseases. During recent years, it has become apparent that saliva is critical for the maintenance and function of all tissues in the mouth. Therefore, any situation that disturbs saliva production or its composition will probably have broad negative sequelae in the mouth and may result in systemic complications. Thus, the aim of the present study was to evaluate and compare the dental caries status and salivary properties of children aged 5–14 years suffering from ALL, IDDM, and Asthma. Part II: Salivary analysis: Salivary analysis was performed by GC Saliva-Check BUFFER kit which included analysis of hydration, viscosity, pH of saliva, salivary flow, and buffering capacity. The salivary parameters from all the three study groups were noted and the further correlated to DMFT/deft index. The data obtained was subjected to statistical analysis. On evaluating the association of caries prevalence with different salivary properties, the results of the present study revealed that leukemic patients had significantly higher caries than diabetic and asthmatic patients. The results of our study were in accordance to Pajari et al. and Hegde et al. The authors reported that pH depletion was observed among leukemic (ALL) children following chemotherapy that increased the risk of dental caries., Likewise, Mazaheri et al. attributed to reduced salivary flow and pH following chemotherapy together with increase in the consumption of sweet drinks and soft foods. Babu and Kavyashree also found the same results, (DMFT [46%]/deft [76%]) which was found to be significantly higher in the ALL group than in the control group (DMFT [13%]/deft [66%]). They attributed the increased caries incidence to the fact that in the age group taken in their study (5–7 years), it could be due to an inadequacy of manual brushing in this age group. In addition, they also attributed this to oral pediatric medications which contained high amounts of sucrose leading to more decayed primary teeth. Azher and Shiggaon attributed increased caries prevalence in leukemic patients to the prolonged time the primary teeth are being exposed to the bacterial plaque and it also due to the absence of regular dental checkups and a delay in their treatment. Contrary to the present study and the above-mentioned studies, Babu et al. (2016) reported no significant difference in the caries experience before and after the initiation of chemotherapy in children with ALL. Results of the present study revealed that caries prevalence in diabetic patients was better when compared than leukemic patients but decreased than asthmatic patients. In accordance to the results of the present study, Bassir et al. (2014) also inferred increased prevalence of dental caries in diabetic patients and attributed this due to the leakage of glucose from blood into the oral cavity. In our study, diabetic patients had taken >60 s to hydrate their mucosa that is they possessed low hydration and increased salivary viscosity. Similar to our study, López et al. also reported diminished salivary flow rate in diabetic children. Reduced salivary flow, one of the most important factors associated with caries prevalence, could potentially explain the cariogenic changes in the oral environment of diabetic patients. According to Siudikiene et al., increased risk of dental caries in diabetic patients was attributed to certain factors such as poor oral hygiene or a lack of blood glucose control. This latter situation could be due to an incorrect diet or deficient control of the administered insulin dose with respect to physical exercise of the timing of meals. Contrary to the results of the present study, Gupta et al. inferred that diabetic patients with reduced salivary flow rate had mean DMFT to be significantly lower. This could be because in diabetic patients, the good metabolic control prevented the most dangerous salivary changes such as high glucose content and lower pH and a good diabetic diet, rich in fiber, and low in simple carbohydrates could slow down the production of plaque and the proliferation of acidogenic bacterial microflora. Similar to the above conclusion, this could may be a cause of decreased caries prevalence in diabetic patients in our present study when compared with leukemic subjects. Results of the present study revealed the least caries prevalence in association with salivary properties in asthmatic children when compared to the other two study groups. Contrary to the results of the present study, Kenny and Somaya (1989) and Reddy et al. (2003) inferred that the highest caries prevalence in asthmatics was seen in those children who were taking liquid oral medications. Likewise, Karjalainen et al. (1992) and Maguire et al. 1996 attributed that the frequent and long-term intake of liquid medicines could also lead to an increase in the actual caries prevalence. Some of the asthmatic children intermittently used these oral medications, especially at night before bedtime. However, the results of the present study concluding less caries prevalence in asthma children may be because the asthmatic study participants in the present study were under inhalers and were not taking liquid medications. This study contributes useful information to further substantiate the relationship between caries and systemic diseases. A dose–response relationship, based on the severity and the duration of the disease, does not always mean that the association is one of cause and effect. Hence, intensive preventive programs are needed for these groups of patients which emphasize early dental care and good communication between the health and dental-care providers. Parents of children should be aware of the connection between diseases and oral health. Leukemic subjects had significantly higher caries and decreased salivary properties followed in descending order by Diabetic subjects and Asthmatic subjects respectively. However, our data support the view that appropriate evaluation of salivary clinical parameters, is recommended when assisting leukemic, diabetic and asthmatic children. These data can be obtained by simple techniques. Early detection of salivary hypofunction in children is important for preventing the deleterious oral effects which follow the absence of salivary protection in the oral cavity. Walsh LJ. Dry mouth: A clinical problem for children and young adults. Int Dent SA 2007;9:48-58. Chauhan S, Mohan V, Kumar JS, Garg N, Mathew SM. Evaluation of flow rate, pH and buffering capacity of saliva in healthy volunteers. Univ J Dent Sci 2015;1:19-23. Mathur VP, Dhillon JK, Kalra G. Oral health in children with leukemia. Indian J Palliat Care 2012;18:12-8. Babu NS, Kavyashree BS. Comparative evaluation of oral health status in children with acute lymphoblastic leukaemia. Int J Sci Study 2015;2:52-5. Purdell-Lewis DJ, Stalman MS, Leeuw JA, Humphrey GB, Kalsbeek H. Long term results of chemotherapy on the developing dentition: Caries risk and developmental aspects. Community Dent Oral Epidemiol 1988;16:68-71. Månsson-Rahemtulla B, Techanitiswad T, Rahemtulla F, McMillan TO, Bradley EL, Wahlin YB, et al. Analyses of salivary components in leukemia patients receiving chemotherapy. Oral Surg Oral Med Oral Pathol 1992;73:35-46. Veleganova VK, Kondeva VK, Uzunova YI, Simitchiev KK. Salivary status of diabetic children. J Int Sci Publ 2014;12:263-76. Gupta VK, Malhotra S, Sharma V, Hiremath SS. The influence of insulin dependent diabetes mellitus on dental caries and salivary flow. Int J Chronic Dis 2014;2014:790898. Goyal D, Kaur H, Jawanda KM, Verma S, Parhar S. Salivary pH and dental caries in diabetes mellitus. Int J Oral Maxillofac Pathol 2012;3:13-6. Abdulrahman KA. Diabetes mellitus and its oral complications: A brief review. Pak Oral Dent J 2006;26:97-100. Stensson M, Wendt LK, Koch G, Nilsson M, Oldaeus G, Birkhed D, et al. Oral health in pre-school children with asthma – Followed from 3 to 6 years. Int J Paediatr Dent 2010;20:165-72. Stensson M, Wendt LK, Koch G, Oldaeus G, Ramberg P, Birkhed D, et al. Oral health in young adults with long-term, controlled asthma. Acta Odontol Scand 2011;69:158-64. Anjomshoaa I, Cooper ME, Vieira AR. Caries is associated with asthma and epilepsy. Eur J Dent 2009;3:297-303. Alaki SM, Ashiry EA, Bakry NS, Baghlaf KK, Bagher SM. The effects of asthma and asthma medication on dental caries and salivary characteristics in children. Oral Health Prev Dent 2013;11:113-20. Milano M, Lee JY, Donovan K, Chen JW. A cross sectional study of medication related factors and caries experience in asthmatic children. J Pediatr Dent 2006;28:415-9. Hegde AM, Joshi S, Rai K, Shetty S. Evaluation of oral hygiene status, salivary characteristics and dental caries experience in acute lymphoblastic leukemic (ALL) children. J Clin Pediatr Dent 2011;35:319-23. Pajari U, Larmas M, Lanning M. Caries incidence and prevalence in children receiving antineoplastic therapy. Caries Res 1988;22:318-20. 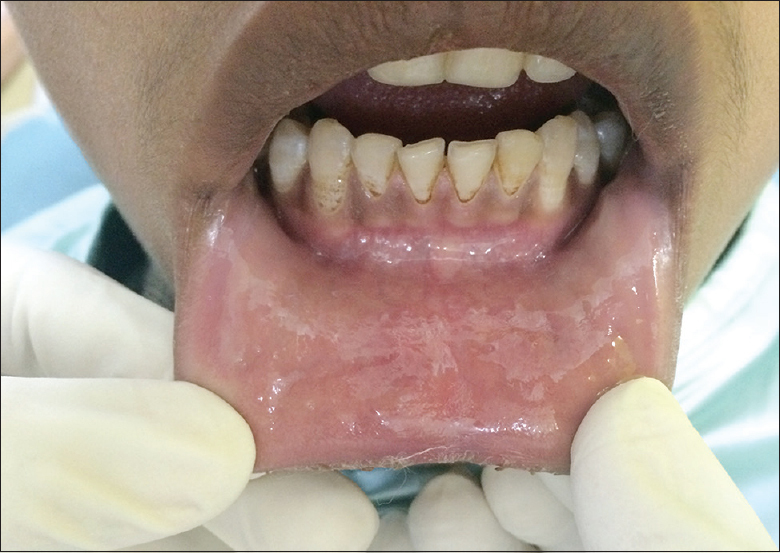 Mazaheri R, Jabbarifar E, Ghasemil E, Akkafzadeh E, Poursaeid E. Oral health status, salivary pH status, and Streptococcus mutans counts in dental plaques and saliva of children with acute lymphoblastic leukemia. Dent Res J 2017;14:188-94. Azher U, Shiggaon N. Oral health status of children with acute lymphoblastic leukemia undergoing chemotherapy. Indian J Dent Res 2013;24:523. Karolewska E, Konopka T, Pupek M, Chybicka A, Mendak M. Antibacterial potential of saliva in children with leukemia. Oral Surg Oral Med Oral Pathol Oral Radiol Endod 2008;105:739-44. Main BE, Calman KC, Ferguson MM, Kaye SB, MacFarlane TW, Mairs RJ, et al. The effect of cytotoxic therapy on saliva and oral flora. Oral Surg Oral Med Oral Pathol 1984;58:545-8. Al-Rawi NA, Al-Dafaai RR, Sammi M. Effect of chemotherapy on oral health status and salivary alkaline phosphatase among leukemic patients. J Baghdad Coll Dent 2013;25:137-9. Babu KL, Mathew J, Doddamani GM, Narasimhaiah JK, Naik LR. Oral health of children with acute lymphoblastic leukemia: A review. J Orofac Sci 2016;8:3-11. Bassir L, Amani R, Khaneh Masjedi M, Ahangarpor F. Relationship between dietary patterns and dental health in type I diabetic children compared with healthy controls. Iran Red Crescent Med J 2014;16:e9684. Ferrazzano GF, Sangianantoni G, Cantile T, Amato I, Ingenito A, Noschese P, et al. Dental health in asthmatic children: A South Italy study. J Dent Child (Chic) 2012;79:170-5. Al-Dlaigan YH, Shaw L, Smith AJ. Is there a relationship between asthma and dental erosion? A case control study. Int J Paediatr Dent 2002;12:189-200. Wierchola B, Emerich K, Adamowicz-Klepalska B. The association between bronchial asthma and dental caries in children of the developmental age. Eur J Paediatr Dent 2006;7:142-5. Thomas MS, Parolia A, Kundabala M, Vikram M. Asthma and oral health: A review. Aust Dent J 2010;55:128-33.